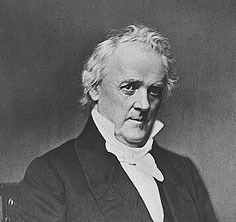 James Buchanan, fifteenth president of the United States, was born near Foltz, Franklin county, Pennsylvania, on the 23rd of April 1791. Both parents were of Scottish-Irish Presbyterian descent. He graduated at Dickinson College, Carlisle, Pennsylvania, in 1809, studied law at Lancaster in 1809-1812, and was admitted to the bar in 1812. He served in the lower house of the state legislature in 1814-1816, and as a representative in Congress from 1821 to 1831. As chairman of the judiciary committee he conducted the impeachment trial (1830) of Judge James H. Peck, led an unsuccessful movement to increase the number of Supreme Court judges and to relieve them of their circuit duties, and succeeded in defeating an attempt to repeal the twenty-fifth section of the Judiciary Act of 1789, which gave the Supreme Court appellate jurisdiction by writ of error to the state courts in cases where federal laws and treaties are in question. After the dissolution of the Federalist party, of which he had been a member, he supported the Jackson/Van Buren faction, and soon came to be definitely associated with the Democrats. He represented the United States at the court of St. Petersburg in 1832-33, and there negotiated an important commercial treaty. He was a Democratic member of the United States Senate from December 1834 until March 1845, ardently supporting President Jackson, and was secretary of state in the cabinet of President James Knox Polk from 1845 to 1849 -- a period marked by the annexation of Texas, the Mexican War, and negotiations with Great Britain relative to the Oregon question. After four years of retirement spent in the practice of his profession, he was appointed by President Franklin Pierce minister to Great Britain in 1853. Up to this time Buchanan's attitude on the slavery question had been that held by the conservative element among Northern Democrats. He felt that the institution was morally wrong, but held that Congress could not interfere with it in the states in which it existed, and ought not to hinder the natural tendency toward territorial expansion through a fear that the evil would spread. He voted for the bill to exclude anti-slavery literature from the mails, approved of the annexation of Texas, the war with Mexico, and the Compromise of 1850, and disapproved of the Wilmot Proviso. Fortunately for his career he was abroad during the Kansas-Nebraska debates, and hence did not share in the unpopularity which attached to Stephen A. Douglas as the author of the bill, and to President Pierce as the executive who was called upon to enforce it. At the same time, by joining with J. Y. Mason and Pierre Soulé in issuing the Ostend Manifesto in 1854, he retained the good-will of the South. Accordingly on his return from England in 1856 he was nominated by the Democrats as a compromise candidate for president, and was elected, receiving 174 electoral votes to 114 for John C. Fremont, Republican, and 8 for Millard Fillmore, American or "Know-Nothing." His high moral character, the breadth of his legal knowledge, and his experience as congressman, cabinet member and diplomat, would have made Buchanan an excellent president in ordinary times; but he lacked the soundness of judgment, the self-reliance and the moral courage needed to face a crisis. At the beginning of his administration he appointed Robert J. Walker of Mississippi, territorial governor of Kansas, and Frederick P. Stanton of Tennessee, secretary, and assured them of his determination to adhere to the popular sovereignty principle. He soon began to use his influence, however, to force the admission of Kansas into the Union under the pro-slavery Lecompton Constitution, contrary to the wishes of the majority of the settlers. Stanton was removed from office for opposing the scheme, and Walker resigned in disgust. This change of policy was doubtless the result of timidity rather than of a desire to secure re-election by gaining the favor of the Southern Democracy. Under the influence of Howell Cobb of Georgia, secretary of the treasury, and Jacob Thompson of Mississippi, secretary of the interior, the president was convinced that it was the only way to avoid civil war. Federal patronage was freely used to advance the Lecompton measure and the compromise English Bill, and to prevent Douglas's election to the Senate in 1858. Some of these facts were brought out in the famous Covode Investigation conducted by a committee of the House of Representatives in 1860. The investigations, however, were very partisan in character, and there is reason to doubt the constitutional power of the House to make it, except as the basis for an impeachment trial. The call issued by the South Carolina legislature just after the election of Abraham Lincoln for a state convention to decide upon the advisability of secession brought forward the most serious question of Buchanan's administration. The part of his annual message of the 4th of December 1860 dealing with it is based upon a report prepared by Attorney-General Jeremiah S. Black of Pennsylvania. He argued that a state had no legal right to secede, but denied that the federal government had any power forcibly to prevent it. At the same time it was the duty of the president to call out the army and navy of the United States to protect federal property or to enforce federal laws. Soon after the secession movement began the Southern members of the cabinet resigned, and the president gradually came under the influence of Black, Stanton, Dix, and other Northern leaders. He continued, however, to work for a peaceful settlement, supporting the Crittenden Compromise and the work of the Peace Congress. He disapproved of Major Anderson's removal of his troops from Fort Moultrie to Fort Sumter in December 1860; but there is probably no basis for the charge made by Southern writers that the removal itself was in violation of a pledge given by the president to preserve the status quo in Charleston harbor until the arrival of the South Carolina commissioners in Washington. Equally unfounded is the assertion first made by Thurlow Weed in the London Observer (9th of February 1862) that the president was prevented from ordering Anderson back to Fort Moultrie only by the threat of four members of the cabinet to resign. Alone among all American Presidents, Buchanan never married. In his late twenties, he was engaged to marry Miss Ann Coleman, who was five years younger than he, but as their wedding date approached in 1819, he apparently developed cold feet and their nuptials were cancelled. She died of an overdose of medication shortly thereafter, generally believed to have been suicide. Many years later, he was romantically linked to Julia Gardiner, who eventually married future President John Tyler. Buchanan raised his orphaned niece, Harriet Lane, who served as his First Lady while he was President. On the expiration of his term of office (March 4, 1861) Buchanan retired to his home at Wheatland, near Lancaster, Pennsylvania, where he died on the 1st of June 1868. His mistakes as president have been so emphasized as to obscure the fact that he was a man of unimpeachable honesty, of the highest patriotism, and of considerable ability. He was the author of the first presidential memoir. "I am now 'solitary & alone', having no companion in the house with me. I have gone a wooing to several gentlemen, but have not succeeded with any one of them. I feel that it is not good for man to be alone; and should not be astonished to find myself married to some old maid who can nurse me when I am sick, provide good dinners for me when I am well & not expect from me any very ardent or romantic affection." Letter to Mrs. Cornelia Roosevelt, 13 May 1844.